Once again we respectfully address the following questions to Mr Paul Boorman, the Global Leader - Operations, who oversees the PwC global operational network, and to Dr Coenraad Van Beek, the Global Leader for Ethics and Business Conduct in PwC. The global brand of PwC faces an impending stain on its newly minted appearance. When an office operating under the global brand of PwC, such as the one that operates here in Kuala Lumpur, Malaysia, commits act upon act of clear cut fraud; sooner or later the stain of these contemptible deeds will besmirch the entire global presence of PwC, and people everywhere will associate the brand PwC with chicanery, and not auditing. We have here evidence of the latest act of fraud committed by your PwC office in Malaysia, with respect to an ongoing civil suit in the Kuala Lumpur High Court. Among the many documents filed in court by PwC Malaysia, there is one that is called Document 41. This document is believed to have been doctored in early 2010, but someone forgot to ensure that the pagination of the document, was double and triple and quadruple checked, so that no one would be able to discover that it is in fact, two documents fraudulently merged to appear as one. So now we have a situation where PwC in Malaysia, has filed a document in court, which has clearly been doctored with, and with the evidence of the tampering as clear as crystal, even to an untrained eye. First of all, there are two page 19's in the document, with contents that are entirely different from one another. Furthermore, the footer and the margins for the two pages are as different as chalk from cheese, and even the fonts used to paginate the pages are not matched. 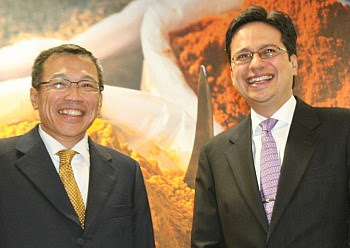 To add insult to injury, PwC in Malaysia is now trying to push the blame for the deception it tried to slip to the court of the land on it's former Directors, both of whom left PwC much earlier than 2010. Pray tell, hasn't the mass shredding of paper in the Enron scandal by Arthur Andersen not taught the big audit firms a thing or two? And even if committing fraud is a standard operating procedure for PwC in Malaysia, how can the evidence that a document has been doctored be left as clear as day, especially when the document is being filed in a court of law, of all places? Shouldn't there be some sort of audit standard for ensuring that evidence of fraud is not staring everyone right in the face? The plan is afoot to publish a book in the year 2012, in the country known widely as the United States of America, on the many acts of fraud and deception which the office of PwC in Malaysia has committed over the past decade or so. The question is gentlemen, what will be the verdict on the total absence of action by PwC's Global Leaders, such as yourselves, in all this? Will it not seem to the readers of the incipient tome; in which it will be narrated that the Global Leaders of PwC, did nothing while PwC in Malaysia transgressed more laws and rules than you can shake a stick at; that you are as culpable as the current crop of masterminds in PwC Malaysia? Wouldn't it be easier to ask that PwC in Malaysia just disclose who are the real people involved in the fraud involving Document 41, so that the preemptive sacrifice of a few nefarious individuals can save the rest of PwC, in Malaysia and globally, from stigma? Think of the thousands upon thousands who carry the brand of PwC every single day with integrity and pride, and how the actions of a few here, is going to sully all that pride. Why make thousands of innocents pay, for the despicable acts of a few?